Hello friends! 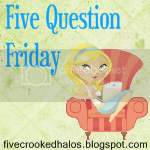 I am linking up with My Little Life for 5 question Friday! 1. Flu mist? Flu shot? Or take your chances? 2. Do your kids have iPads? What are some good educational apps? Price? 3. What are your favorite boy/girl baby names? 5. What is your favorite place to escape to for peace & quiet, to think? Why? And here is my answers!!! 8 comments on "Five Question Friday - Video - "
Thanks for stopping by my blog. Loved your Five Question Friday answers. I will certainly follow your blog. Thanks for stopping by my blog! Loved your answer. I'm following you. @ Rockin Mom.. Your name is too cute! What's your daugthers name?? Summer or Autumn? @ Mama M.. Thanks so much! I just don't believe they help that much.. and Romeo is huge and yes.. he is our fluffy marshmallow! My daughters name is Autumn. Thanks for stopping by 3sonshavei.com...Love the video feature of the hop! @ Rockin mom.. thats what I almost named my daughter!! She was born at the 2nd of November so it would have fit but.. we went with Brittany Belle instead but I love Autumn! @ Erinn.. sooo happy you liked it! I think that is how I am going to do the 5 question post each week. Honestly its much easier than doing a full blog post! Nice to meet you! !